Thomas Fergus Winthrop (1842-1905) was born in Andover to a family of skilled Scottish craftsmen. He was living in Boston when he mustered, as a nineteen-year-old student, into Company A of the Massachusetts 19th Infantry in July 1861. With his cousin James R. Murray of Company H of the Massachusetts 14th, he wrote the weepy ballad “Daisy Deane,” that became one of the biggest musical hits of the war years. In November 1864, the Andover Advertiser printed Winthrop’s “After the Battle,” presumably sent from the field. 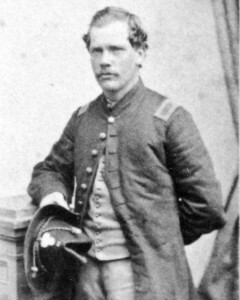 Unlike his friends in Company H, Winthrop saw a lot of battle action before 1864, including the engagements at Antietam and Gettysburg, and worked his way up the ranks from private to captain. Winthrop married twenty-year-old Mary Raynor of Andover at Ballardvale’s Union Church in December 1868. He worked for the rest of his life in the railroad industry, moving around the country and working for a number of lines including the Central of Vermont, the Hudson River, the Missouri Pacific and finally the San Antonio & Arkansas Pass. After Mary‘s death at Champlain, New York in 1880, Winthrop remarried before moving his family to Texas. He died in El Paso at the age of sixty-three.